On Saturday night the Legends defeated the Windy City Bulls, affiliate of the Chicago Bulls, on the road to improve to 1-1 on the young season. A good player always recognizes the ways to enhance their performance, even in victory. “We still have room for improvement,” the 26-year old knows. “We have to get better in the 4th quarter. I gotta take some responsibility for that. Williams also led the team in threes, making 5-of-9 attempts. He knows that this part of his game is what will elevate him to the next level. The 6’5” Williams is a tremendous athlete, playing bigger than his already elastic frame. He tied Jameel Warney (16 points, 13 rebounds) for a game-high two blocks. He attributes just as much of his defensive expertise to his basketball mind as to his basketball body. On media day, Williams told me about his prior experience with Coach MacKinnon, something which has made it easier to get off to a fast start. Legends Assistant Coach George Galanopoulos had an especially unique experience in Saturday’s win as the Chicago native made his coaching debut in front of a few familiar faces. 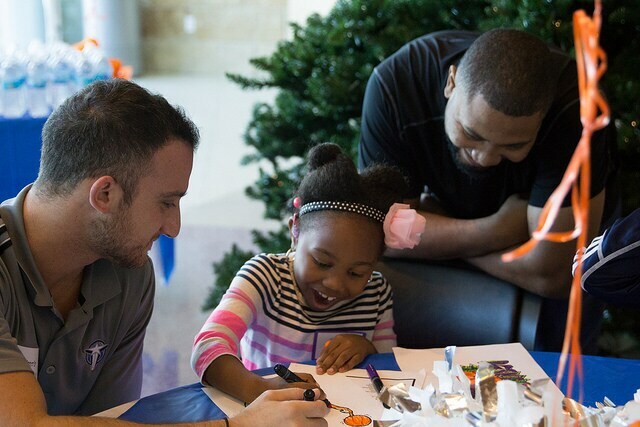 Assistant Coach George Galanopoulos at the Children’s Medical Center Hospital. The Legends took it easy on Sunday after a busy travel day including connecting flights from Chicago to Reno where they will face the Bighorns, affiliate of the Sacramento Kings. The Legends face the Reno Bighorns Tuesday night at 9:00 PM CST and the Salt Lake City Stars, affiliate of the Utah Jazz, Wednesday night at 8:00 PM CST. They return home Saturday night in an encore effort against the Stars at 7:30 PM CST. You can catch all the games live at facebook.com/Texlegends.